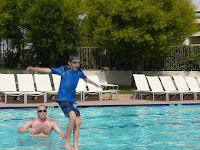 This was our last day in Palm Springs. With all the road-tripping, the week really flew by. 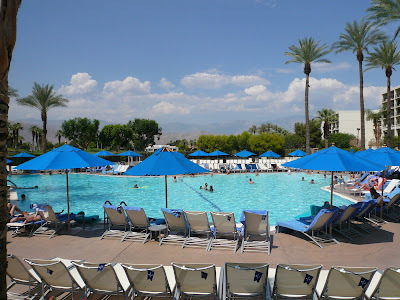 We purposefully planned to have this last day at the resort, with nothing else planned, to allow us a chance to rest before the long travel day back home on Saturday. In the morning, we arose late, and had a leisurely breakfast in the room. 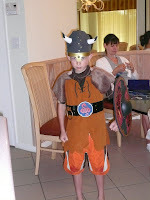 Luke took the opportunity to try on his new Legoland Viking suit, which he obtained for Halloween. I must say, if Vikings can look dashing, then Luke was one very dashing Viking. 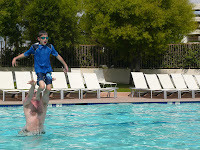 The boys and I played around in the pool quite a bit. They enjoyed it when I would throw them bodily across the water, and afterwards, even let me teach them a little diving in head-first. 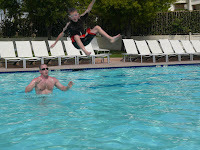 They are getting quite brave in the pool, and almost have diving down. I must say, we had a great time. This kind of father-son time cannot be overvalued. 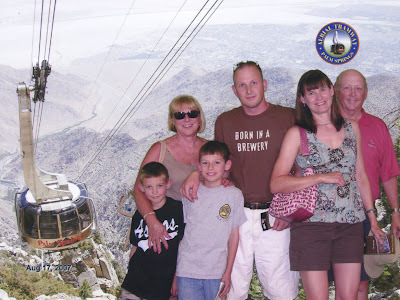 After lunch, we decided to take the Palm Springs Aerial Tramway. I had been told this was a cool thing to see, but we really didn't quite know what to expect. Boy, were we in for a surprise! First of all, the tram is state-of-the-art Swiss engineering. 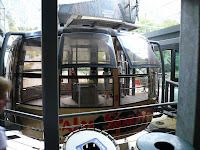 The tram car is a circular car which rotates completely as it ascends the mountain, giving a 360 degree view to all of its riders. 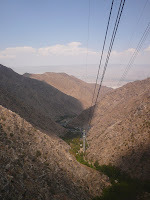 Secondly, the tram ascends a near vertical and totally stomach wrenching 8500 feet from sea level on the desert floor. We did not know this before we embarked on the tram. 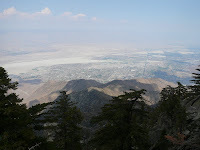 When we arrived at the top, we were greeted with weather that was at least forty degrees cooler than the desert below. It goes almost without saying that the views of the city, over one and a half miles below us, were spectacular. We were all really glad that we took the effort to make this tram ride up the mountain. 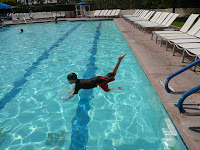 Finally, after all was done, and the boys had emptied Nana's pockets in the gift shops, we headed back to the resort for a final swim and dinner before packing up and heading home the next day. In all, it was a very fun vacation. The boys, Becky and I, all had a very great time. Thank you, Nana and Grandpa, for sharing it with us! Did Vikings have "chicken legs"? Somehow, I pictured them as more muscular! I must have been asleep when Luke was modeling his Viking outfit! 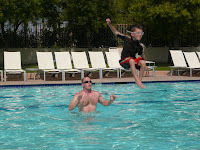 The throwing the kids into the air shots are impressive (both in capturing the moment and the height you were getting). And I must say you're putting those nice looking abs to work tossing them that high. Nicely done there Mr muscles. Maybe if I work out while on the roids I can get that defined (although I seriously doubt it). You do look a tad sunburned though. 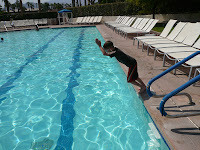 The diving shots look a lot like Quinn does when he tries to dive. I have to add... my boys don't weigh much more than 50 lbs. so it makes throwing them really easy.